After reports emerged about Tetenal closing its doors, the UK team has responded saying they aren't going anywhere. Towards the end of January, it was reported that employees at Tetenal in Germany were informed that the company was set to close in April which made people wonder if the rest of the company's branches would also be suffering the same fate. However, a statement from Tetenal UK confirms that this is not the case. 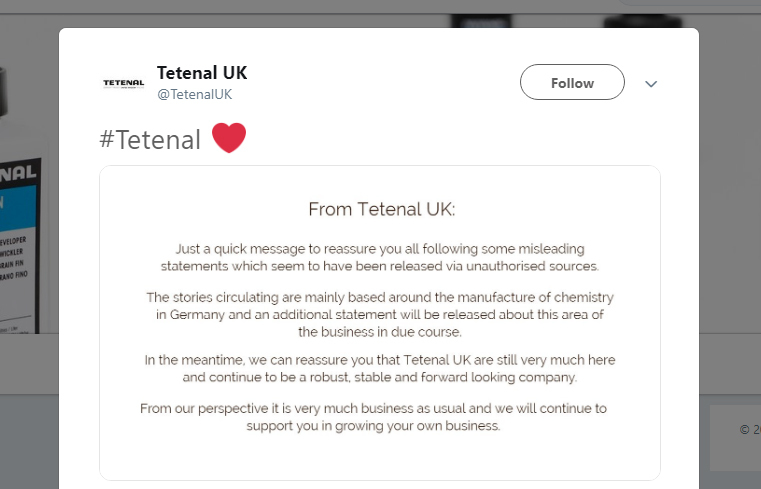 On Twitter, Tetenal UK said some misleading information had been circulated and that the stories were mainly about the manufacturing of chemistry in Germany, which more information will be released on in due course. The team also said they wanted to reassure customers that Tetenal UK is 'very much here and continue to be a robust, stable and forward-looking company'. From our perspective, it is very much business as usual and we will continue to support you in growing your own business," says Tetenal UK.